On the Rebelscum forum last week, i noticed an incredible Millennium Falcon painting on the ACME Archive wall at Disney. No information was available, but Chris Wyman was kind enough to take some photos for me. 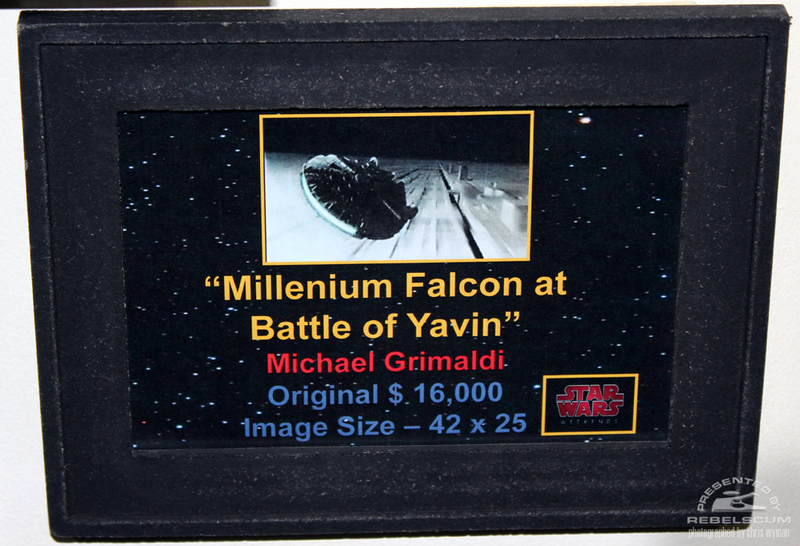 Called “Millennium Falcon at the Battle of Yavin” by Michael Grimaldi, it really is a beauty. I think that there’s a real sense of speed in this painting that just whooshes you along with it. I’ve seen many other art pieces of the Millennium Falcon’s history, but outside of Vanderstelt’s “She’s Got It Where It Counts, Kid“, you don’t often see this scene depicted. Refreshing (I fancy that i can just make out the fighters in the Death Star Canyon but i think it’s my eyes playing tricks on me. At the moment, only the original is for sale and at $16, 000, it’s way out of my price range. Still, hopefully ACME will release a limited edition print of this stunning piece. This entry was posted in Art, Things that i don't have yet... and tagged Art, Michael Grimaldi, Millenium Falcon, Millennium Falcon, Star Wars. Bookmark the permalink. You may want to check out what Chris has done with the Falcon, nice work.